Is dog food making your dog sick? It took me years of trying to help my sick dogs get well before I learned the truth about dog food. "All your dog needs to thrive is a balanced and complete dry dog food. Dogs don't need any other supplements, your dog food is formulated to provide everything dogs need to stay healthy." "Your dog doesn't need vitamins or supplements" Followed closely by "Don't ever give your dog people food!" Long years of experience have told me that just the opposite is true, and I'm glad to say that even the mainstream veterinary community is starting to come around to another, more natural way of looking at how we feed and care for our pets. The vast array of dog food at the pet store is mind boggling, what’s the healthy choice? No wonder poor pet owners are confused. Dog food companies have deep pockets and enormous advertising budgets. Glossy magazine ads and television spots assure us that each fancy new dog food is finally what we've been searching for. A diet that will keep our dog healthy, A dog food that will help our dog thrive and not be at the vet's office every other month for one new health problem after another. The sad truth is that most pet owners spend their hard earned dollars on diets that lack the nutrients that their pets need to avoid the epidemic of diseases that are the norm for pets today. I've seen it all with dogs. From working as a veterinary technician and that close up look at pets and their problems and diseases. Two decades as owner of an upscale pet boarding kennel. As a long-time dog breeder, I've watched scores of good dogs develop one chronic debilitating disease after another. And do you want to know the truth? If you feed your dog a commercial diet and don't do anything else to support your good dog? 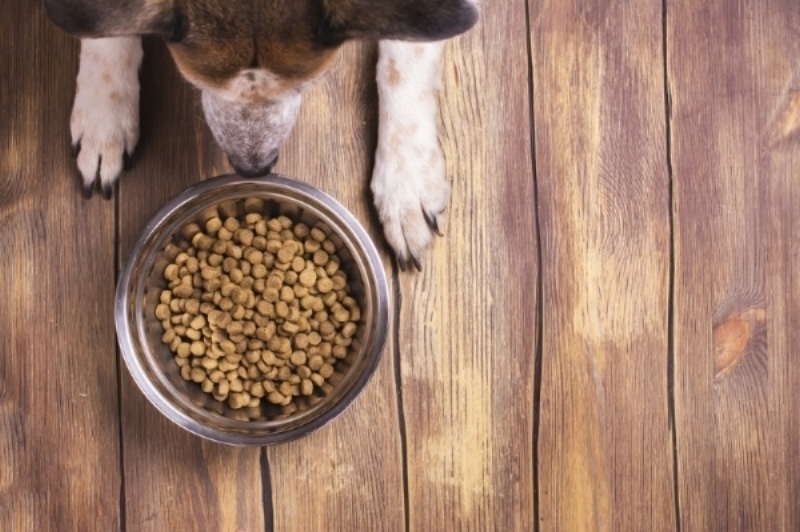 Worried about feeding your dog a diet that will keep him healthy? You’re not alone. If you believe the advertising and you depend on dog food alone to keep your dog healthy? It often begins insidiously. Often your poor dog is allergic to many of the ingredients in her food. Look on the label of that fancy bag of kibble. Hopefully, at least it's grain-free and you're not going to see problematic items like corn. There are lots of other allergy producing in most commercial dog foods. Why should that concern you? Don't we all struggle with allergies? Food allergy problems with our pets are something that we really need to take seriously. Remember those flea drops? How about the spray that goes on your lawn to keep weeds at bay? Or the deicers on the sidewalk where you exercise your pet? All are chemicals that pets absorb or lick and groom off their coats every single day. Back to our dog food discussion. When your dog is allergic to ingredients in her food, that allergy often triggers a gradual decline that most owners don't realize is a warning of their more serious, hidden issues that are beginning to affect your dog. Issues that can cascade suddenly into conditions that prematurely age our dogs, and make them susceptible to a breakdown of their entire immune system. A weakened immune system can open the door to cancer, kidney and heart disease, the list is long and the risks are very real. That painful ear infection that returns over and over again and just won't go away. Sometimes it's a skin condition that causes incessant scratching and hot spots. Digestive problems that come and go with little long-term relief, IBS or pancreatitis, which can be debilitating and even deadly. You'll begin spending more time and lots more money at the veterinarians office. Your dog will go home, often after the "routine" injection of Prednisone, often the go-to treatment for a long list of canine ills, Prednisone, which you are dismayed to find causes your good dog to have her first accidents in the house since she was a puppy. What's the poor pet owner to do you ask? Finding a decent dry dog food almost requires a doctorate, all you want to do is keep your dog healthy and not spend hours trying to decide how to do it. My methods have changed so much in the last decade. Today I tell my clients to try to shift pets to a diet that consists largely of whole foods, sweet potatoes, eggs, meat and yes dairy in the form of yogurt or kefir. Lots of fresh vegetables round out that fare. It's amazing what your dog can learn not only to accept but relish when it comes to vegetables.